The White House has withdrawn the nomination of its physician, Adm. Ronny Jackson, to be secretary of Veterans Affairs. 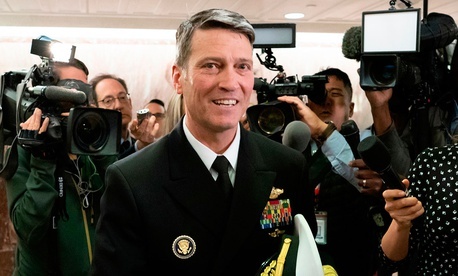 Jackson is best known for his fulsome report on Trump’s health following an annual physical in January 2018. His nomination came into question after allegations surfaced that he abused subordinates, created a hostile work environment, was drunk on the job, and freely passed out prescription pills including Ambien, Provigil and Percocet. The allegations came from various sources, including a summary prepared by Democratic Senate staff. Now, whoever gets that position will have the task of trying to manage an agency that has long been in crisis. Nevertheless, the VA has pioneered evidence-based medicine and, overall, gets better outcomes at lower costs than many private health care providers. The VA has 360,000 employees and a US$186 billion annual budget. As someone who has studied government budgets and the organization of government agencies, I believe the next secretary, like his predecessor, will have to address three major problems if the VA is to be effective in meeting the needs of the millions of veterans who depend on it for their care. First, the VA is funded much less generously than private medical providers. That means VA doctors earn substantially less than other physicians, making it hard to fill vacancies. Occasionally, Congress votes to increase the VA budget, allowing the department to offer raises or one-time bonuses that attract new physicians. But then, subsequent budget cuts and government-wide salary freezes drive VA doctors to the private sector. Physician and nurse shortages, due entirely to inadequate budgets, are the main reason why veterans have long waits for appointments and procedures. Second, the VA has no control over the number or location of veterans who gain the right to medical care through their military service. The number of veterans was shrinking prior to 9/11. The wars in Afghanistan and Iraq made 4 million additional veterans eligible for VA medical services. Dramatic advances in saving the lives of wounded soldiers mean there are more severely disabled veterans needing complex care. Growing understanding of the psychological effects of combat has led to a dramatic increase in the number of veterans who apply for and can benefit from psychological treatment. In addition, veterans, like other Americans, are more likely to live in the South and West than earlier generations. Thus, VA hospitals and clinics, mostly built in the post-war era, are not where the veterans live. It should be no surprise that some of the longest waits for care and the center of the scandal around VA officials falsifying data on the wait time for care was in Arizona, an area with many veterans and not enough VA facilities. Finally, many conservatives and for-profit health providers in search of new customers want to convert the VA into a conduit for government money to buy private insurance or care for veterans. Private care is more expensive and generally of lower quality care than what the VA now provides. Thus, increasing the use of private facilities will disrupt the continuity of care that is the basis for much of the VA’s lower costs and better outcomes. Funds diverted to pay for private care will rob the VA of resources needed to hire more doctors and nurses or to build facilities where they are needed. President Trump said he fired former VA Secretary David Shulkin, the man Jackson had been nominated to replace, to facilitate further privatization. Veterans’ organizations and members of Congress from both parties oppose privatizing because of the deleterious budgetary and health effects they say it would have. It remains to be seen what role the new VA head will play in this conflict. The outcome will determine whether the VA’s problems worsen as the VA takes on the faults of America’s private health care system, or if the VA is given the resources to demonstrate the advantages of government provided medical care.